Farafina is proud to announce the Nigerian edition of AMERICANAH, the highly anticipated novel by award-winning author Chimamanda Ngozi Adichie. Release date is April 21, 2013 in Lagos. In the months following the release, the author will go on a national book tour with stops in major cities across Nigeria. Price: Hardback N4500, Paperback N2500. Upon release, AMERICANAH will be available in all major bookstores across the country. Details of national book tour will be announced later. “Age was respected among his people, but achievement was revered. As the elders said, if a child washed his hands he could eat with kings.” – Things Fall Apart, pg 5. It is not a surprise the amount of tributes that have poured in from around the world following the passing on of perhaps Nigeria’s greatest ever writer. 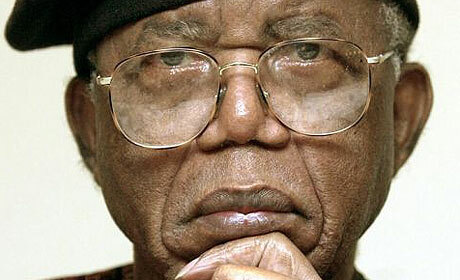 Chinualumogu Albert Achebe died at the age of 82. Chinua’s telling of stories and his command of the English language, was such that the moment you picked up a Chinua Achebe book, putting it down became almost an impossibility. His understanding of the culture of his Igbo people, my people, was also virtually unrivalled. A lot of the Igbo proverbs I learned first, I learned from his magnum opus, Things Fall Apart. However, when talking of a giant of literature such as Chinua Achebe, it is plain wrong to use the phrase magnum opus to describe his work. His craftsmanship as a story teller was such that he had a plethora of work that made up his magna opera. As compared to a lot of people, Achebe was a man of character, who refused not one, but two national honours because he was not at peace with the way Nigeria is being run. Only if our government(s) had been reading. No Longer At Ease, his second novel, and in many ways more poignant than Things Fall Apart itself, is a book that peers deep into the Nigerian psyche and foretells in more ways than one, the emergence and eventual proliferation of Nigeria’s current national malaise, corruption. “It is all lack of experience,” said another man. “He should not have accepted the money himself. What others do is tell you to go and hand it to their houseboy. Obi tried to do what everyone does without finding out how it as done.” He told the proverb of the house rat who went swimming with his friend the lizard and died from cold, for while the lizard’s scales kept him dry the rat’s hairy body remained wet. In that passage, describing the reaction of the Umuofia Progressive Union after Obi Okonkwo had been caught for bribery, Achebe tells us about our own complicity in this culture of corruption that is destroying our country. The truth was that the members of the Umuofia Progressive Union were not concerned about the fact that Obi accepted bribes. Rather, their grouse was that he accepted bribes without covering up his tracks. This, up until today, half a century after those words were set in stone, is the root of our disease today. The seer that he was, peered into our psyche even in such a “mundane” thing as our stamina as a people. In Arrow of God , Ezeulu, given the power to make decisions on behalf of the god Ulu, Ezeulu would not dare test that power. But his people, were quick to abandon him on his return from prison, because of the “small issue” of being unable to harvest their yams. The conversion of the people of Umuaro to Christianity because Ezeulu did not perform the New Yam Festival, foretold our inability to weather storms as a people, together. A failing talked about by another Nigerian great, Fela Kuti, in his Sorrows, Tears and Blood. But Chinua Achebe was not just a writer about culture, tradition and the contemporary. One of the first books I recall reading, was Chike and the River. Being ethnically from that region, but hailing from another part of the country, I began to, at that young age, appreciate the vital importance of the River Niger to commerce in our environment. Chinua, as he grew older, and especially after Nigeria’s devastating Civil War, became more introspective, and tried to, in his own literary manner, warn us about the road we were taking. A warning that, as a people, we have failed to heed. There you have it. He was probably the first to identify something that a few Nigerians are beginning to come to terms with, that our founding fathers were not all that. Such was his genuine insight into the character of this country that he called home. In his last book, There Was A Country, came for the first time since I started reading him, long passages that I disagreed with. However, one cannot fault what he wrote because he clearly stated from the beginning, that the book was a personal history. That personal history, was perhaps his greatest gift to Nigeria. Mistakes were made in those dark years between 1966 and 1970. Those mistakes are finally being documented by some of the people who went through those days. We MUST learn from it. Regarding the man, it is simply impossible for an iroko tree to fall and the forest will remain quiet. The tributes and obituaries that have poured in from various parts of the world should be a pointer to the younger generation of Nigerians. Chinua Achebe was by no means a wealthy man. He was not a pauper either. But by using his God-given talents, he achieved global recognition. Now that the curtains have been drawn on his life, we can all sit back and see how the world treats a genuine icon. He lived to a grand old age. He was also an achiever. And the world has now shown, it is not only among ndi Igbo that achievement is revered. In publishing Things Fall Apart at age 28, Chinua washed his hands early. And Kings invited him to the table, such that he had the luxury of choosing what banquets to attend, and which to reject. Iroko ada na! Dike eji aga mba na gbo. Prof, kachifo. Keduzi onye anyi ga-eji eme onu? Keduzi onye anyi ga-eji jee mba? Anya mmili julu m anya. Chinua Achebe, naba no ndokwa. A mighty tree has fallen! Now who is there for us to boast about? Who will be our rampart? My eyes are in flood with tears. Chinua Achebe may your soul rest in peace. POWER, POLITICS AND DEATH IS BACK!!! – Rainbow Bookshop, 20 Igbodo Street, Old G.R.A. For all other orders outside the listed cities please call Kachifo LTD on 0807 736 4217; 01 7406741 or send us email at orders@kachifo.com. If you somehow missed the news in the last 18 months and are wondering what all the fuss is about Power, Politics and Death read on. Those who follow the political scene in Nigeria closely know that there are some secrets hidden from even Wikileaks! Power, Politics and Death, the book by Olusegun Adeniyi which Mohammed Haruna described as the thriller in the villa, provides an insider’s account of the late President Yar’Adua—the man and the president—as never told before. Adeniyi, spokesman for the late president, tells of President Yar’Adua’s time in office in a manner that is both honest and heartfelt, going past the rumours and speculation that surrounded his administration and his health to deliver the truth. He also exposes the power tussles and intrigue that go on behind the scenes, in the corridors of power. Power, Politics and Death is sure to change the way you think of Nigerian politics and the late President Yar’Adua. To celebrate World Book Day, we’re posting a spoken word performance about books — by Obii. Enjoy. The first time I read, I arrived. First within the pages of Nwapa, Emecheta & Onwu… Then… Achebe, Amadi & Ike. An escape from the cultural afflictions that lined streets. Obii are you still here? and I was going to catch at least nine hundred and ninety-nine. and by 15 I knew I would one day tell mine. When I discovered poetry, I decided there were not enough colours in the world. Okeke, Christiana Rossetti, Okigbo…shaped my hand, my future. All came in fragile pages that stand like pillars, 23 years and counting.